Welcome to NPC Firewood sales and supplies. 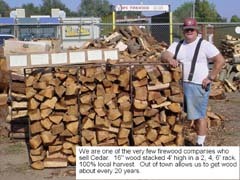 We are a family owned and operated firewood business since 1971.We buy and sell premium seasoned firewood. Firewood types we sell: pine,oak,euculyptus,walnut,fruitwoods and cedar hard mix are some ..Buy firewood by the 8 cu ft bundles,truckfull or have us deliver to your home,price depends on area your in..Orangevale,Roseville,Fair Oaks,Rocklin,Sacramento,Citrus Heights,Folsom to name a few..Sold in 16" and 24" sizes for fireplaces and if you call a few days ahead of p/up , we can cut 12"-14" for firepits etc.. We value our customers and support our local business' here in O'Vale.Please, Just give us a call and ask about any SPECIALS we might be running on FIREWOOD that week. Although there are a variety of measuring units, firewood is normally sold by the cord, or a fraction of a cord. The dimensions of a "standard cord" is a stack of wood piled 8 feet long, 4 feet wide and 4 feet high. We are one of the very few companies that sell Cedar Firewood. Our Cedar Firewood is 16" stacked 4' high in a 2', 4' or 6' rack. One of our hottest burning wood at approximately 35 millon BTUs per cord. Our wood has heavy cracking which allows for easy lighting. Our most popular wood. Burns very hot at up to 36 million BTUs. Supplied in 16" wood stacked 4' high in a 2,4,6,8, or 12' rack. 90% local harvest. REMINDER: The drier your wood is, the better and cleaner it will burn, and the less creosote buildup you will have. Your stove or chimney cleaning needs will not be as frequent, and above all, you will limit yourself and your family to the minimum risk of having a chimney or stove fire. As always, have your fireplace chimney cleaned every 1-2 years depending on cresote buildup. Woodland - Antelope - North Highlands - Lincoln - Granite Bay - Newcastle and many more!